CHANGED ROLE: Fiji's coups have politicized the country's soldiers. Baledrokadroka was one of the participants at the Canberra workshop, Fiji At Forty, held to mark Independence Day. This is the paper he presented. Fiji’s military has become an all pervasive institution of politics. The military’s traditional hard security role has merged with a politically nuanced human security role. The present state of Fiji’s political instability is related to the role expansion of Fiji’s military since Independence. The expansion has been marked by an over-emphasis on non-core activities such as nation building, peacekeeping and internal security. This has had a deleterious effect on the political stability of the nation. Why, and how, has this development taken place? Since cession in 1874 the patriotic adage of For God, King and Country was grafted onto and sat well with Fiji’s colonial and Fijian society. This slogan of British imperialism ethos was fully adopted and adapted into Fijian society as the Lotu, Vanua kei na Matanitu. In the 96 years of British rule this slogan underpinned the colony’s military service through two world wars and the Malayan Communist emergency campaign in the 1950’s. Ratu Sukuna epitomized Fijian imperial loyalty and latent nationalism with his “we must sacrifice blood on the battlefields to become a nation” rallying somber appeal for the war effort. After Independence Fiji’s civil military relations pattern was a hybrid between Nordlinger’s traditional aristocratic and liberal democratic models. This hybrid pattern since independence cohered well with the ruling Fijian elite in the form of the Alliance party government of Ratu Sir Kamisese Mara. Since the mid-seventies the military became increasingly used by the Alliance government under Ratu Sir Kamisese Mara in a civic national building role though with a predominantly ethnic Fijian bias. The raising of the Trade Training School in 1974, the Engineers Rural Development Unit and the Naval Division in 1975 saw the military increase to over three times its size. In 1978, with Fiji’s first deployment of troops with the United Nations interim forces in Lebanon the peacekeeping role became a force determinant. A detachment was sent to Zimbabwe in 1980 and in 1982 another battalion was raised as part of the Multinational Forces and Observers in Sinai Egypt to monitor the Israeli-Egyptian peace accord. This new role increased numbers to over 2200 regular force soldiers by 1986. All during this expansion period, recruitment was always kept at over 95% ethnic Fijian. The huge ethnic recruitment numbers disparity was simply put down to the ‘unappealing nature of soldiering’ to Indo- Fijians. In retrospect, a quota system of recruitment should have been done to even up the ethnic numbers balance in the RFMF. Unfortunately, this heavily skewered ethnic recruitment only reinforced tacit ethnic elitist political association within the institution. Being overwhelmingly ethnic Fijian, the military was always to be a bastion of indigenous political paramountcy. In fact, during the March 1977 elections (the second since independence) where the Indian dominated NFP party had won by the slightest majority but were unable to form a government the military was put on alert. The question still remains today, what would have happened hadn’t the Governor General Ratu Sir George Cakobau appointed Ratu Sir Kamisese Mara to form a minority government until the September 1977 elections? On the other hand as informed by a prominent Indo-Fijian, it came as a huge relief that Mara was reinstated for obvious reasons - Fijians would have definitely agitated against the NFP government. Suffice to say, therefore, the three major troop numbers increases were brought about by local and international political expediency rather than in response to any clear defence role. Hence Nation Building; Peacekeeping and Internal Security became the force determinant for the military. International peacekeeping exposure to the world’s hot spots- especially the Middle East, has imbued a confident political mediator disposition amongst Fiji’s military officers. Rubbing shoulders with big name politicians, UN officials and Middle East factional leaders of the PLO and Hezbollah was all part of a Fijian senior officers lot during a tour of duty. With the 1987 Rabuka coup many of the senior officers became similarly entwined with the Fijian political elite. Rabuka’s coup shattered the Westminster civil-military relations ethos and explicitly unveiled the fragile nature of Fijian democracy since Independence. It seemed the Westminster model lasted so long as government was made up of the Fijian political elite. With Voreqe Bainimarama recently emphasizing ‘only the military can bring about change’ the political role of the military persists. The militarization of government since is real evidence of this politicized role. Over 40 military officers are still holding important government posts from Prime Minister, Cabinet ministers, Permanent Secretaries and other postings on boards of various statutory bodies. In a parallel development since 1998 the recruitment of over 2,000 Fiji citizens for service with the British armed forces has been ongoing. This has had significant economic and social implications for Fiji with remittances reaching an all time high of more than F300million in 2005. The third factor that increased military numbers was the internal security role that evolved out of the 1987 coup. The size of the military reached 3,600 in December of 1988. The army raised the number of infantry battalions and the number of soldiers in each battalion to ‘effectively control’ the emergency situation, although many saw that emergency as being one the RFMF had created in the first place. An elite counter revolutionary warfare unit was formed to protect against government armed insurgency. 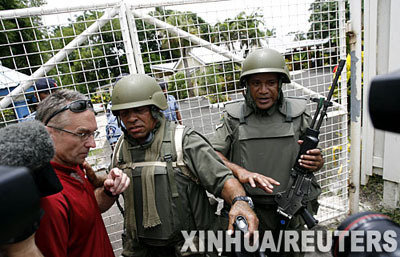 As a consequence of executing a supremacist coup in 1987 against a phantom internal security threat, the military in a convoluted way created for itself an internal security role previously the ambit of the Fiji Police Force. Ironically, in taking upon itself the IS role, like scores of developing countries in the sixties and seventies, Fiji is now a coup prone state. The huge increases in military expenditure and blatant budget blowouts since the 1990’s till today is evidence of a military that has not read the history of coup prone country’s. In these countries, militaries have strangled the economic life in the name of guided development and security. In many post colonial states, civil supremacy under the aegis of democracy is often threatened by the military’s colonially-inherited legacies. Often, such societies are troubled by severe schisms of a regional or ethnic character. The military, however, acquires a colonially-induced unifying function. And that given its self image as leading nationalists the military is commonly able to rationalize away or sincerely justify their predatory actions. Since they identify with the nation what is to the advantage of the military is also good for the country. It is as almost if coups promote the national interest. Western military ethics stress the supremacy of society over the individual, tribe or sub-group, and the importance of order, hierarchy, and division of function in the service of the nation state. Foremost of this military colonial legacy is the principle that the military commander must never allow his military judgement to be warped by political expediency. Unfortunately, this principle has been compromised as in the Nigeria and Fiji coups with highly professional armies that are drawn from one predominant ethnic group and do not reflect a unified nation. If governments seem captives of those sub-national forces, the incentive for military intervention may become strong. The degree to which corruption is itself a major cause of military coups is, however, open to question. Despite its prominence in post coup rationalizations, one might suspect that it is a secondary cause in most cases. Perhaps more significant is military leaders' distaste for the messiness of politics - whether honest or not – and a tendency to blame civilian politicians for failure to meet overly optimistic popular aspirations which would be impossible to fulfil even by a government of angels. Again, this type of thinking may be the result of the realist and rather simplistic mindset prevalent in military leaders that resorts to coercion in dealing with political evils. For the military view of man is decidedly pessimistic and that the man of the military ethic is essentially the man of Hobbes. Bainimarama’s 2006 ‘clean up’ or good governance coup rhetoric played to such sweeping justification and an instrumentalist view. On the other hand military intervention into civilian affairs is not precipitated solely by military groups or elites. Perlmutter found that in most cases civilians turn to the military for political support when civilian political structures and institutions fail or when constitutional means for the conduct of political action are lacking. The civilians begin to form interventionist coalitions or indoctrinate the military with their political ideologies. Several examples of this process can be found in the Middle East and Latin America and recently in Fiji. Perlmutter also found that “corporatism is a prima facia case for interventionism and that professionalism is only one guarantor of non- intervention”. This appears to be the case in Fiji prior to the 2006 coup. The commissioning of a security review white paper by the SDL Government in 2003 further undermined the fragile relations with the Military Commander. The paper recommended among other things, a fifty percent cut in the number of the Fiji Military Forces and a change to the selection process for the Commanders position. The Fiji military, though a considerably small force, consisted of a highly professional officer corps - a credit to its British military legacy. Since independence the traditional aristocratic- liberal democratic pattern of civil military relations worked well enough. 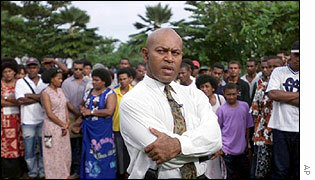 This did not stop the RFMF, however, from overtaking democratically elected governments in 1987, 2000 and 2006. One way to look at the driving forces of military intervention or non-intervention is through Finer’s disposition/opportunity theory. It's here that Finer identifies the disposition of the military elite – which is bound to its corporate and individual interests - as the push factor. The pull factor is the opportunity that the political ‘crisis’ offers as a key condition for a military political intervention. According to Finer’s calculus of intervention, the subjective military disposition factor and the objective opportunity factor acting in unison are the most relevant triggers to the likelihood of a coup. The pre-coup interventionist coalitions of Rabuka and the Taukei Movement in 1987, Speight and Nationalist politicians in 2000 and Bainimarama and the Labour Party in 2006 are clear examples. Today, Fiji’s colonial legacy, and the military self-image fostered during the colonial period, continues to impact modern day politics. The weak division of labour in emerging nation states and the way in which it may exacerbate ethnic divisions that give rise to the military taking over in a mediator role and creating a coup prone or praetorian state. ‘Revulsion against civilian incompetence and corruption’, as many have argued, is a frequent justification for intervention by military forces in newly-independent states. Commodore Bainimarama has often used this excuse for his 2006 clean-up coup. In addition, the military corporate interest is foremost in a military elite’s calculus for intervention. In many Third World countries military ‘professionalism’ has come to mean not Huntington’s old professionalism of external defence, meaning that a professional armed force is one that is subject to civilian authority, but something quite different. The new professionalism in Third World countries such as Brazil, Burma, Thailand, Nigeria, Indonesia and Fiji is expressed in the capacity of the military to assume a politicized role and, either temporarily or permanently, to take the reins of state power and dominate government. Finer takes the argument further in two ways: his disposition and opportunity theory offers an explanation of the push–pull factors that cause the military to intervene in politics; and he suggests an ascending scale of modes of military intervention in politics from working through constitutional channels to overthrowing civilian governments. I have endeavoured to explain why the military forces have intervened in Fiji’s politics so consistently since 1987 was the natural result of its non core role expansion, the extent to which Fiji exemplifies wider patterns of intervention found elsewhere, the form which intervention has taken at different stages of this story, and the reason for the absolutist character of the intervention that began with the 2006 coup. In the last four decades since independence, the military through its last three commanders, has indeed become a political animal. And finally having researched the literature on military disengagement from politics in the post colonial era, the quicker the military disengages from politics the better for all of Fiji’s citizens. Vinaka Vakalevu. Editor's Note: Footnotes not included. 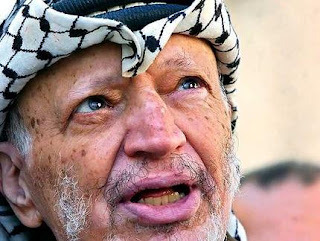 Pictures: PLO leader Yasser Arafat (middle) and George Speight (bottom right). A sharp analysis, indeed. There are a few elements that merit more detailed exploring though: What I believe is missing is the prominent role the United Nations and its demand for peace keepers has played in militarizing Fijian society. This is of particular importance as the UN still seems to be in total denial what it has done in Fiji. One of the solutions to Fiji's predicament clearly lies in the UN acknowledging its responsibility by terminating any participation of the Fiji military in UN peace keeping. The Fiji Military, particularly under the current poor leadership, has failed its own nation. Fiji is 40 years old and the people, under this current regime have no freedom, no voting privilege and now with the collapse of Fiji Times as a real newspaper, no media freedom. Coup apologists, mostly useless trash who have achieved nothing in life, try and put a spin on the human rights abusing pocket filling regime. The coup apologists, and other money grabbing carpet baggers and rejects, have failed. Whereas those with the courage to stand up to the cowardly regime, like the former editor of the Fiji Times, will get employment offers internationally and will be remembered and recognised for their integrity and principles, whereas coup perpetrators and supporters will get no recognition, no emplyment outside of bludging on the coup, and will be remembered by history for the trash that they are - those who survive that is when the clean up comes! @ Anonymous 11.37a.m. - whilst I agree that terminating peacekeeping missions for Fiji would be effective as long term solution to re-building our nation as one people, I disagree with you that the UN is in denial with what 'it's done to Fiji' insomuch as what we've done to ourselves, as a people and as leaders. Do all other countries with peacekeeping missions have a militarized state and a dictatorship? Problem within officer core - not rank & file. The military in Fiji needs good ledership. The quality of leadership will affect the military and the quality of life in our nation. The current leadership in the military and in our nation have become leaders bacause of circumstances. The military personnel have saturated the government and boards and committess affiliated to government and business and the results we are seeing in the collapse of the sugar industry, near-collapse of the Fiji Electricity Authority etc. They were not trained for such positions. The day the Commodore and his band of merry men return to barracks that is the day Fiji will return to freedom and prosperity politically, socially and economically. although We concur which terminating peacekeeping quests with regard to Fiji will be efficient so long phrase means to fix re-building the country as you individuals, We don't agree along with you how the UNITED NATIONS is within refusal using what 'it's carried out in order to Fiji' insomuch because exactly what we have carried out in order to ourself, like a individuals so that as frontrunners.